After four decades as a successful teacher/coach at both the high school and college level, Buster has turned his love for raptors and falconry into a business. 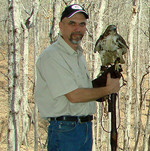 Now, as a Master Class falconer he is training hawks and falcons instead of athletes. 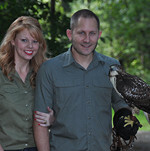 Georgia Mountain Falconry will include not only hunting with birds of prey, but falconry & raptor education, and working with homeowners and businesses to chase off feathered pests through the use of trained birds of prey. (Abatement). He is a self taught practical welder and blacksmith. Over the last ten years Damon has taken his work with metal arts to the art of knife making. His company, Alfa-Knife, is making great strides in the custom knife world because Damon makes each knife by hand and guarantees them for life. To go along with this, he is a teacher of martial arts and survival skills. 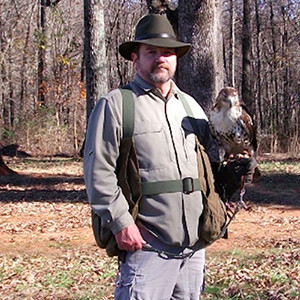 Damon will take his love for all things raptors and play a major role in all facets of Georgia Mountain Falconry, from education, to hunts, to abatement. Rodney is recently retired from a NE Georgia textile manufacturing company. He lives in the mountains of Habersham County in a home he built by hand. Rodney (a Master Class licensed falconer) will be involved with abatement for GMF, but his primary role will be in propagation of our hawks and falcons as well as continuing to produce quality raptor food, including rodents and quail.